Last week when I made my Mixed Berry Napoleons, I made extra puff pastry for a quick breakfast the next morning. I split the puff pastry, added some Nutella and fresh fruit and served it to my overjoyed family. My husband loved those breakfast treats so much, he insisted I find more ways to incorporate puff pastry into our breakfast. So this week, I decided to take puff pastry to a savory place with these little puff pastry egg tarts. These were so easy to make. You start by pre-baking the puff pastry. 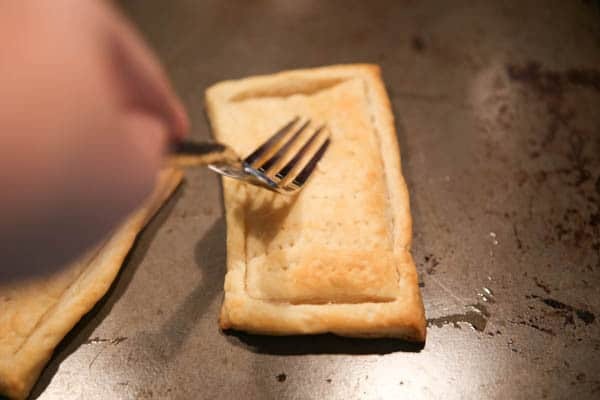 To make sure it doesn’t rise too much, I just cut the edge of the pastry and priced the bottom of the pastry with a fork. Then I put the egg in the pastry and baked it. I love this recipe because you can really make it your own by garnishing with whatever toppings you’d like. Here I kept it simple by just adding tomatoes, spring onions and cilantro. You could also add any type of meat like bacon or sausage or any yummy cheese. Next time I’m thinking some queso fresco sprinkles with chorizo, tomatoes and cilantro. If you’re concerned about your eggs be sure to use Davidson’s Safest Choice pasteurized eggs. “Davidson’s Safest Choice® Eggs are pasteurized in an all-natural, gentle water bath pasteurization process to eliminate the risk of Salmonella. The vast majority of eggs sold in grocery stores are NOT pasteurized. Safest Choice™ offers peace of mind when making recipes calling for raw or undercooked eggs, and removes the worry of cross contamination.Learn more about Safest Choice pasteurization process and find store locations. 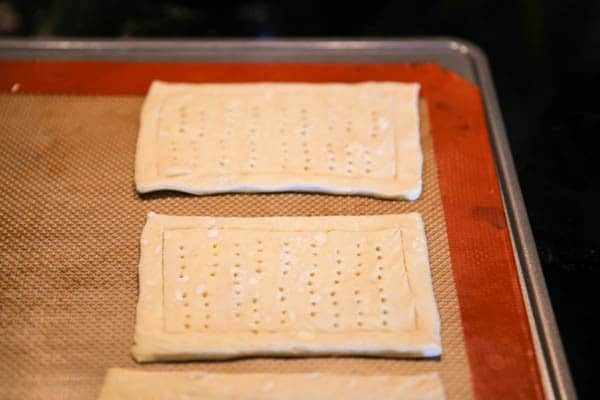 Defrost puff pastry according to package directions. Cut puff pastry into 4 sections and scour an edge on pastry, creating g a crust. Prick the middle of the pastry with a fork. Bake pastry for 10 minutes, or until light golden brown. Remove pastry from oven and press down the middle to deflate. Break an egg on top of the pastry and return to oven. Bake eggs until desired doneness. 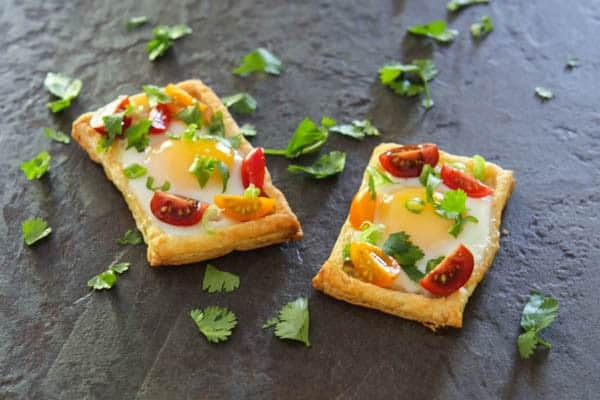 Garnish puff pastry eggs with desired toppings. Here I have used quartered cherry tomatoes, chopped spring onions and fresh cilantro. Perfect for breakfast or a light lunch or dinner! I love these, Angie! I always have puff pastry in my freezer because it’s so easy to use for so many different things. My hubby is going to be thrilled when I make these for him this weekend. Very cute, Angie! Egg tarts are a great brunch idea. Now this is my type of breakfast! Or lunch. Or even dinner. Love the egg! This is exactly why I love puff pastry…it’s so easy to whip up something that looks pretty spectacular. Love these, Angie! 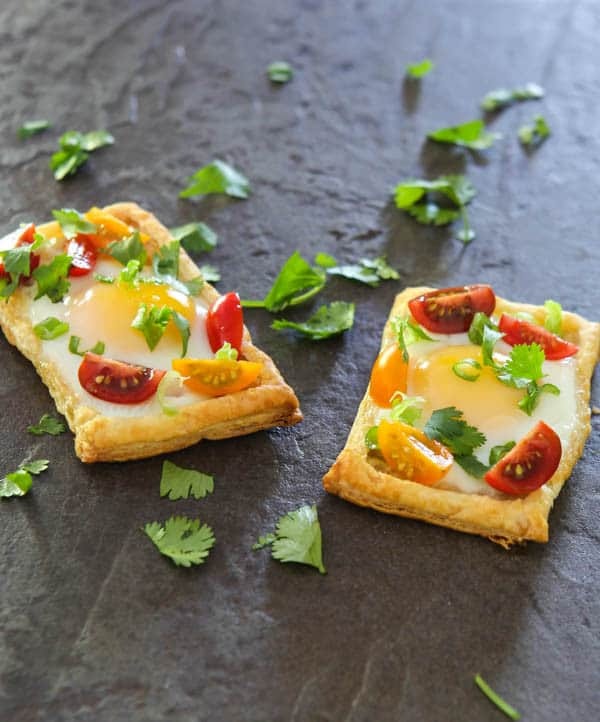 Puff pastry always makes everything taste and look great…these are no exception! It’s good reason to always have a stash in your freezer! Such a great idea to make these little egg tarts! May have to give them a go this weekend! Thomas would love them! I’m not very creative with breakfast foods so I’m always super impressed when someone comes up with something like THIS! 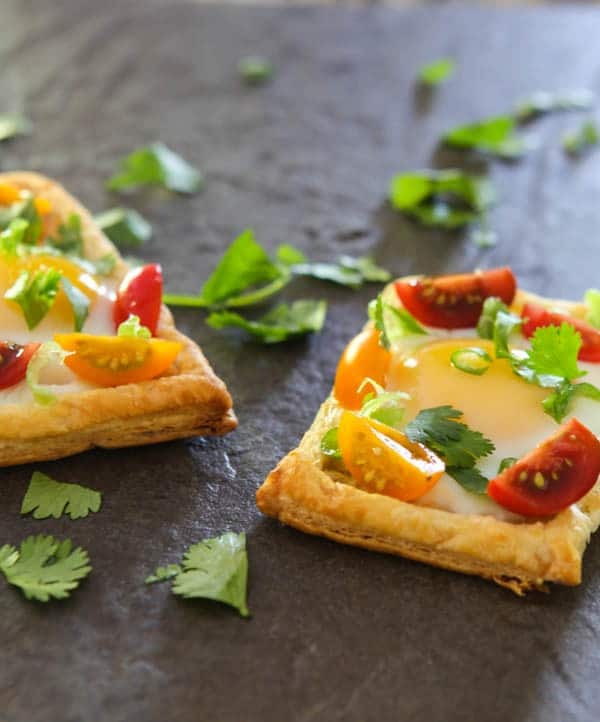 These Puff Pastry Egg Tarts looks incredible and I love the photos!! I could definitely go for these breakfast, brunch, lunch, and dinner! Anything with an egg on top and Im sold! I want to say one belated “Thank you!”. Last week i was a host to one event in my home. I make 50 of these and in less of an hour nothing was left. So Thank You ANGIE !